The Transformers! More than meets the eye! Autobots wage their battle to destroy the evil forces of the Decepticons! The Transformers! Robots in disguise! This is MY Transformers, the one I knew long long time ago (ok so now you roughly know my age hahaha! ), that made me sat in front of the tv same time every week, joining them for yet another 30 minutes battle. It is a far cry from what we've been seeing now, never mind the flatten, uninteresting drawing, it still has a special spot in my heart. And yes I still hum the original Transformers song when I see them on tv. DinoBoy was introduced to Transformers when he was about 3+ years old, he saw them from the cable and as with every one, he fell in love with them instantly. He was over the moon when he knows that he is going to meet his 2 favourite Transformers hero. You can read about it here. Couple of months later he received his first Transformers toy, his favourite amongst the favourite; Bumble Bee from us. Truth to be told, he was the excuse for ME to get a Transformers toy since I did not have a chance to play with their toys during my time. So I gladly purchase the expensive toy to a 4 year old. You would think that DinoBoy will play it like having a car race with his other toy cars its in the Camaro state or fight the baddies when its in the robot state. Noooo~~~ He would not have ANYTHING like that, every 5mins or so he will bring the toy to me and said "Mummy, please change it for me.". Most of the times I obliged but sometimes I was in the middle of doing something and could not do it for him. He will try to change it or wait patiently for me to do it for him later. Over the years his love for Transformers grew, he received some more Transformers toys & stationeries from us and friends, he even want to dress up as Optimus Prime on one of the Halloween party in his school. 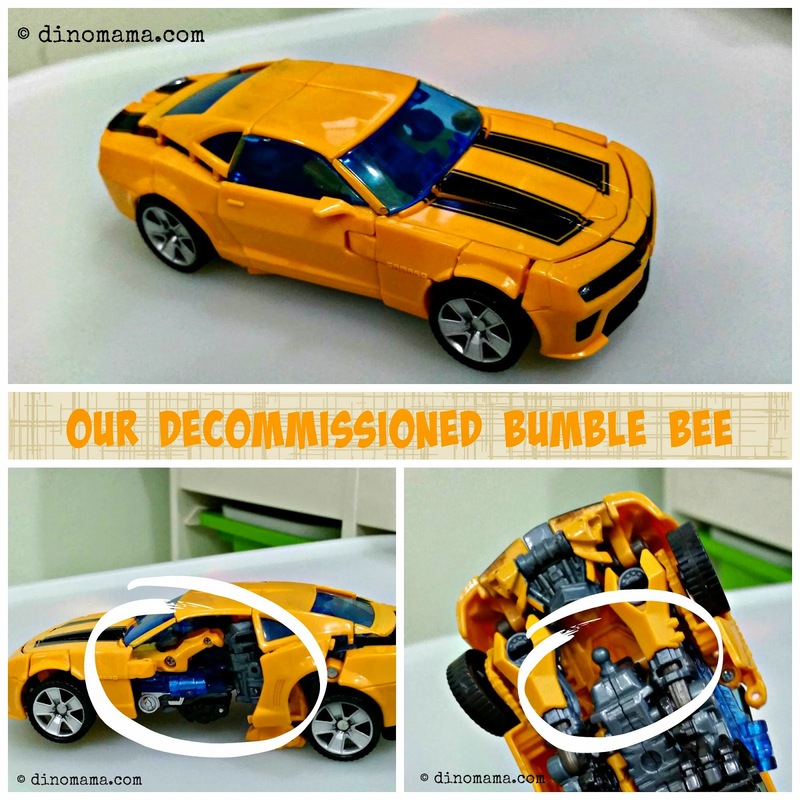 We are glad that he has learn to take better care of them after the Bumble Bee incident therefore no further "casualties" after Bumble Bee was decommissioned. 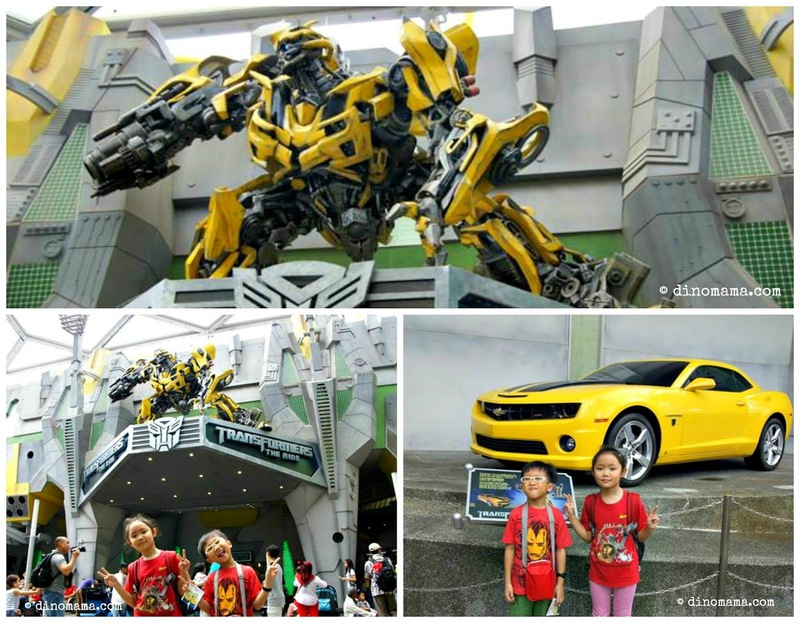 We went to Universal Studios Singapore in 2013 and the Transformers The Ride was the highlight of the day, we couldn't have enough of it and went on the second time. We have also watched all of the Transformers movies, both in the cinema and reruns of the movies on the cable countless of times. We have the Transformers Dark of the Moon DVD, some nights we will prepare snacks like potato chips or popcorn, snuggle up the sofa and have a Transformers movie night at home. 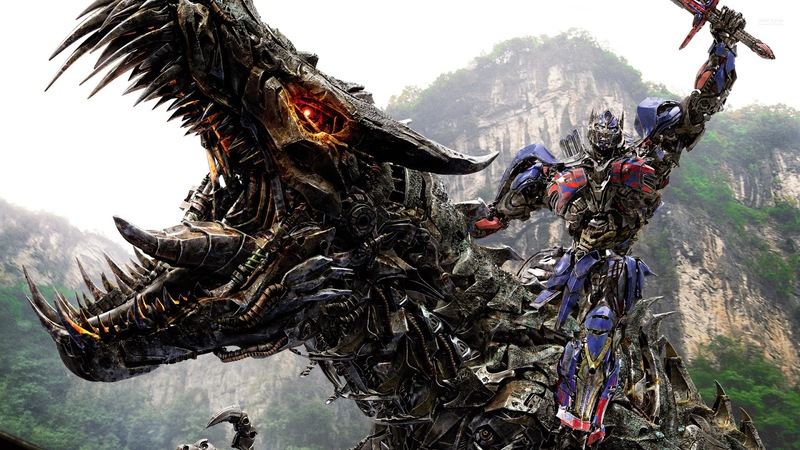 I especially like Transformers: Age of Extinction; even the storyline is a little bit cheesy, because there are Dinobots! I have a soft spot for dinosaurs, hence the name of this blog hehehe~ My heart was pumping adrenaline when the Legendary Warriors appeared on screen, what a great sight for me! This is one of my favourite scene of the movie, the leader of the two groups together, looking mighty, strong, invincible and magnificent. If you are a huge Transformers fan as we are you will know that Transformers is celebrating 30th Anniversary. In conjunction with this celebration Hasbro is sponsoring the DinoFamily 3 sets of Transformers hampers worth SGD100 each to be given to 3 lucky DinoFamily readers! Simply pose with your favourite Autobots, flaunt your Transformers collection or share with us your experience at the Transformers movies! You MUST hashtag your Transformers experience with #Thrilling30SG & #HasbroSingapore, #dinomamagiveaway, remember tag us @din0mama and to set your account to public for it to be searchable. And since I am a self-proclaimed creative DinoMama, I would lurveeee~~ to see some creative entries such as the one below. I will pick the 3 most creative entries as our winners. So unleash your creativeness and great photography skill NAO! Open : Singaporean Citizens and PR residents except employees of Hasbro Singapore. 1. Like DinoFamily, click here. 4. Post a photo with your favourite Autobots, flaunt your Transformers collection or share with us your experience at the Transformers movies in instagram. - All instagram entries must be posted from a public account to qualify. - Prizes are non-exchangeable and non-transferrable. - By participating, entrants agree to be bound by all terms and conditions, which are final and binding in all aspects and waive any right to claim ambiguity. - Hasbro Singapore reserves the right to alter any terms and conditions with prior notice. - Participants MUST comply to ALL the criteria as stated above, failure to do so means immediate disqualification. - Winners will be picked by the DinoFamily and be contacted via instagram comment on their photo and they will have 24 hours to respond otherwise a new winner will be picked. 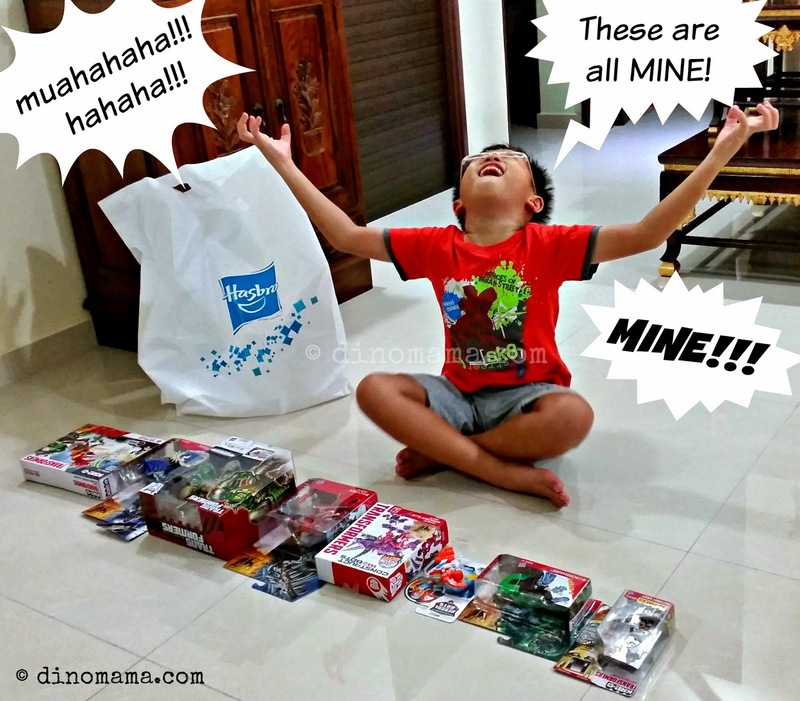 - Winners will be contacted by Hasbro Singapore regarding collection of prizes. The DinoFamily will be relieved off any responsibilities from this giveaway after we give the winners' details to sponsor. Disclaimer : We are in no way affiliated to the staffs and management of Hasbro Singapore. We were gifted a Transformers Hamper as compensation for this post, no other compensation was received. All opinions are 100% ours and photographs belongs to DinoFamily unless otherwise credited accordingly.